Shredded kale, organic mesclun, pears, apples, raw pecans, organic white cheddar, basil, balsamic vinaigrette. Jennifer Higa: Fall is the season for apples, as they overflow the wooden crates at the Farmer’s markets and appear on every dining room table. 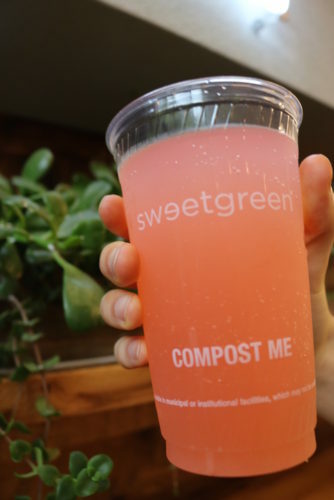 Sweetgreen has taken this classic fruit’s crisp and juicy character to sweeten the bitter and peppery kale and mesclun greens. Rounded out with buttery pecans and the creamy white cheddar, the earthy flavors of fall are captured so beautifully in this salad. With a surprising punch of flavor from the fresh basil, this bowl is sure to satisfy all your fall cravings. Organic arugula, warm quinoa, curry-roasted cauliflower, cilantro, shredded cabbage, roasted chicken, raisins, sweetgreen hot sauce, cucumber tahini yogurt dressing. Spicy, creamy, sweet, smoky–this warming grain and veg bowl captures fall’s embrace in a dish. The curry cauliflower adds a kick of aromatic spices and rich flavors that are cut with the tangy and creamy dressing. Your palate gets balanced out by the bursts of juicy sweetness from the raisins and zesty cilantro. If you’re looking for a bowl that will fill you up and excite your tastebuds, this one is for you. Organic mesclun, chopped romaine, roasted brussels sprouts, roasted sweet potatoes, roasted chicken, cranberry maple dressing. Kathy Wang: When I first opened my bowl, the sweet and smoky smell of Brussels sprouts filled the air, and I couldn’t wait to dig in. Along with the roasted sweet potatoes and the cranberry maple dressing, the Chicken + Brussels bowl reminded me of Thanksgiving, minus the massive food coma. The creaminess of the potatoes contrasts nicely with the crunch of the greens, and the tang of the dressing brings the whole bowl together. I found the dressing to be a little sweet and lacking in the cranberry flavor, but it definitely fit the fall theme. With the chicken and the sweet potatoes, the salad was definitely filling and fueled my late-night studying. I wish there had been more Brussels sprouts, but maybe that’s just because I’m borderline obsessed with them! A light, refreshing fresca made with fresh cranberries and a hint of ginger. J: Baby pink, this drink is definitely a cute fall drink to walk around with. Unfortunately, cute is all it is. The drink’s flavors didn’t quite live up to its looks with no cranberry flavor coming through, it tasted like water with a chunk of grated ginger. It was lacking balance and complexity. However, worth trying out if you want to kill that stuffy nose that has come on since the season has changed, with its spicy ginger kick. K: I’m not really a fan of ginger in general, so I was a little hesitant to try the Cranberry Ginger Fresca. With the bright pink color of the drink, I thought it would taste more like cranberries, but my first sip was overwhelmingly ginger. As I continued to drink it, the flavors began to grow on me, but I’m not sure if I’d get it again. Who can we thank for these delicious fall combos? Chef Stebner, the culinary mastermind behind your fall favorites, who has kindly answered some of our burning questions (oh, and he’s shared his favorite salad recipe, too)! What is your process in coming up with a new combination? Do you experiment in your own kitchen or create combos in your head, first? I like to start by experimenting with produce that is in season; food just tastes better when it’s fresh. That’s the approach we take at Sweetgreen. I like to try different combinations of fruits and vegetables that are in season together, coming up with complex pairings and textures. We have a beautiful test kitchen at our Culver City location, where I do my recipe testing and development. Do you grab inspiration from any chef or cuisine/culture (eg.Japanese, Mexican, Indian)? What do you think makes your salads different from the other “Make-Your-Own” salad stores around the country? 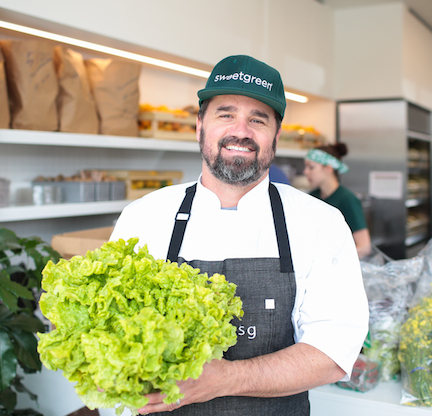 At Sweetgreen, we start with the best possible ingredients, quality that you would find in a high-end, full-service restaurant, we just serve them in a fast-casual setting. We focus on using local and seasonal ingredients to create complex flavor profiles. 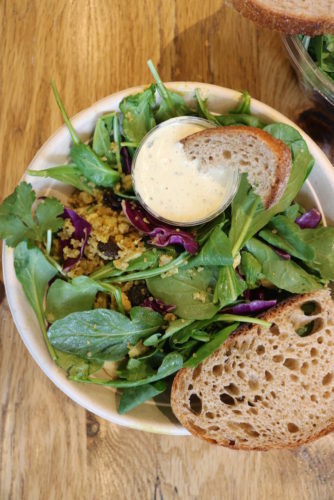 Our signature salads and warm bowls incorporate different flavors and textures to give them dimension, creating a craveable and satisfying meal that you can feel good about. We’re also very transparent about where our ingredients come from and how they’re prepared — each Sweetgreen has a source list that changes depending on where we source our ingredients, and our open kitchens let you see the team cooking all day. Classic, and extremely hard to answer, but what is your favorite food? Salad! A salad can incorporate so many ingredients and flavors to create something unique time and time again. They are a great way to utilize seasonal ingredients and challenge yourself to build a meal that is nutritious and delicious at the same time. Why did you become a chef? And how did you end up working as a chef for SweetGreen? I was lucky enough to learn how to cook from my mom at a young age. She introduced me to farm to table back in the late ‘70s while I was growing up in the Willamette Valley, OR. We used to pick our own fruits and vegetables, and the local farm had an open-air market that was closer than the nearest grocery store. I used to watch Julia Child with my grandmother as a child at her house, but I didn’t know that there were chefs until I started working in restaurants at 16. Working as a busboy at a hotel in Scottsdale, AZ, I became so interested in what was happening in the kitchen. I talked my way into becoming a prep cook and was lucky enough to find a mentor in the chef, who took me under his wing. I have been cooking for 28 years, and I believe that knowing how to cook, and having a depth of knowledge in healthy eating is a powerful combination these days. I am lucky to have been able to learn from great chefs, and healthy lifestyle teachers along the way. Do you have any advice for aspiring chefs? What helped you get to where you are? What did you study as a student? Any regrets or must-do’s? When I started cooking, there were no culinary schools like there are today, and the schools that were available were financially out of reach for me. When I started getting serious about becoming a chef, I was about 19 years old. I committed to only working with chefs that I admired. I was in Scottsdale, AZ, near some of the best resorts in the country. I would work for 1 year in one location, and possibly work 2 jobs to make ends meet, but only in restaurants that I really believed in, and for chefs I could learn from. Cooking is a trade, the more you do it the better you get. I was lucky enough to be able to work with some of the best chefs in the country at different times in my career, and that diversity helped me find my own style of cooking. If you would have asked me about being a Director of Culinary for a healthy fast casual brand 5 years ago, I would have laughed at you. But here I am! I was willing to adapt to a changing food scene, and always learning along the way. My only regret is that I did not go to college, I was too focused on becoming a chef, and I didn’t like school. Now I’m a parent, and trying to convince your kids to do something you didn’t do is hard. 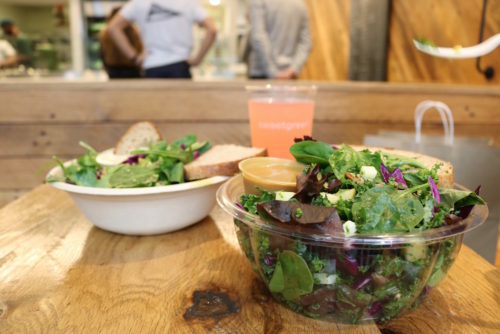 Many people, including myself, always ask why our homemade salad bowls can’t taste like Sweetgreen’s! What advice do you have for people trying to make good salads at home”? My biggest advice is to start by choosing produce that is in season — swing by the farmers market to see what’s coming out of the ground right now. The freshest produce always tastes best, and seasonal food is always better together. Try to think about flavors that compliment each other. For example, smoky meats pair best with a hearty dressing, and dry cheeses like parmigiano are great with briny rich items like eggs, anchovies, marinated peppers, and olives. Is there a recipe you could share with us for a component of a salad or for a salad bowl that you really like or that has a special place in your heart? This time of year, I love roasted squash, and I put it into so many things at home: tacos, noodle bowls, curries. The best and easiest way to cook a hard squash is to cut it into thin slices after removing the seeds — and leave the skin on for butternut, acorn and kabocha varieties, because it helps the squash hold together. Then season the pieces liberally with olive oil salt, pepper and any spices that make sense for your final flavor. For example, use cumin and/or chili powder for tacos, and sesame oil and/or ginger for Asian flavors. Lay the squash out on a sheet pan in a single layer and cook under the broiler or in a hot oven for 10 minutes or until slightly tender. It tastes great when it gets a little burnt on the edges. There are currently 72 locations around the country as of 2017!